As early as 1840, after the novel ‘Frankenstein’ was transformed into a stage play, the name Frankenstein was wrongly assumed to belong to the creation rather than the creator. The plain explanation of this persistent misunderstanding is that the Creature dominates the story and no innocent man was ever likely to be called Frankenstein. The irony has significance. Shelley, who had misleadingly claimed she dreamt the name, used her novel to warn against hatred of those who were different. The audiences, who welcomed the Creature in the subsequent play and films, insisted on the opposite and demanded a monster. The fame and notoriety of her creation was supported by the prejudice Shelley thought she was undermining. The Creature in the novel possesses curiosity, intellect and sensitivity but, for all his fine feelings and belief in his noble ambition, he is no innocent. It leaves him with extreme remorse but the need for violent vengeance exists. Readers of the novel are usually sympathetic because they discover the Creature is a talented man whose creator denies him authentic kinship and purpose. Those who know the Creature from only the Karloff movies, assume he is a monster. As Miranda Seymour explains, in her biography of Mary Shelley, ‘dramatised versions had drained its life fluid while hugely increasing its fame’. If there was no more to the tale than this, it would correspond to the life and career of Elvis Presley, the creature once known as ‘The Pelvis’. The novel, ‘Frankenstein’, by Mary Shelley was first published in 1818. The full title is ‘Frankenstein or The Modern Prometheus’. The Prometheus myth, to which the title refers, has the usual complicated history adored by classical scholars. Various versions exist and, within them, there are different scenarios and characters. The following account is basic but it suits the purpose of this book. Prometheus was the son of lapitus by Clymene, one of the Oceanids. His mother was the generally well regarded goddess, Themis. Prometheus was a champion of mankind and he stole fire from Zeus by hiding it in a giant, fennel stalk. Prometheus gave the fire to the mortals who were pleased because it had originally been stolen from them by Zeus. The god Zeus did not share the democratic sympathies of Prometheus and responded by having Prometheus chained to a rock where a great eagle attacked him and ate his liver. Each day, his liver would grow again and, each day, the eagle would return to eat his liver. Understandably, Prometheus was indignant because this is no fun. Eventually, Hercules arrived and killed the eagle with an arrow and freed Prometheus from his chains. The myth evolved further and, in the Greek Tragedy, ‘Prometheus Unbound’, by Aeschylus, Prometheus created life from clay and water. The introduction to the Wordsworth print of ‘Frankenstein’ claims, though, that this alternative myth is Roman and not Grecian. It is the version with Prometheus as the maker of mankind that inspired the Mary Shelley novel of ‘Frankenstein’. Mary Shelley intended her book to be a warning against what modern man, lacking a connection to others, might do with his desire to invent, understand and control. This is neither a book about Frankenstein nor the Prometheus myth. It is about Elvis Presley but there will be references to the novel when appropriate and this book will insist that both a curse and a complex betrayal did exist. The Frankenstein myth, like that of Prometheus, has evolved and, within the novel and the movie adaptations, there are various elements that connect to the life of Elvis. These consist of the crude figure whose primitivism paradoxically inspires the future, the orthodox ideology that he offended, the ordinary villagers who became agitated by the myths that they created about the Creature and the mad scientist who, like Parker, failed to understand that he only brought the Creature into existence and that the Creature had independent life. The stage play added the willing assistants who failed to realise that the scientist they helped was mad rather than gifted. A century later, the 1931 movie transformed the doomed child beside the lake into someone other than the younger brother of Victor Frankenstein, someone less horrified and more trusting. Two aspects of ‘Frankenstein’ and its relationship to Elvis merit immediate comment. First, to keep the plot simple and to make him an agent of his own destruction, the Creature had to kill the child by the lake. There are different versions of this scene in the book and the movies and his culpability varies but the Creature is always capable of savage cruelty. In the Elvis story, the child by the lake not only exists but is infused with wonder at the sight of the exceptional creature. There was also more than one child and these children survived to become the fans. They constitute a separate story. Although Elvis was condemned for being uncouth by different generations in different ways and was always scorned by a large number of villagers, he, at least, had acclaim from the children by the lake. The Creature, unlike Elvis, was only hated by others. After Elvis appeared by the lake, the children never fully understood their fabulous friend and why he could be so difficult. They defended him when they sometimes visited the village to meet those who were horrified but, though, they did not want him vanquished like the other villagers, they were sometimes hurt by his indifference and destructive behaviour. Many needed an explanation of why they could be so drawn to such a difficult creature. Eventually, all these innocent children, sitting by the lake, grew and hardened. Soon, their obsession irritated the villagers who realised that these uncomprehending children had imagined an alternative creature. A more forgivable, complex and fabulous being now grew inside the spirits of the children. Second, the Creature was severely handicapped by the crude, plastic surgery that existed in 1816. Although he had beautiful features, he was eight feet tall and his skin was stretched too tight across his face. Apart from the blind, he merely horrified. Elvis was considered handsome but the principle of maiming still exists. Early Elvis horrified with his sideburns and clothes and the later Elvis repulsed with his blown up body and white suits. There is a British TV version of ‘Frankenstein’, defiantly called ‘The True Story’, which featured a handsome actor called Michael Sarrazin as the Creature. The tale is told differently but the ending is still tragic. The unfulfilled need for authenticity and authority undermines the privilege gained by his beauty. The primitive violence of the handsome man still colludes with his destruction. Both versions, the handsome and maimed creations, apply to Elvis. 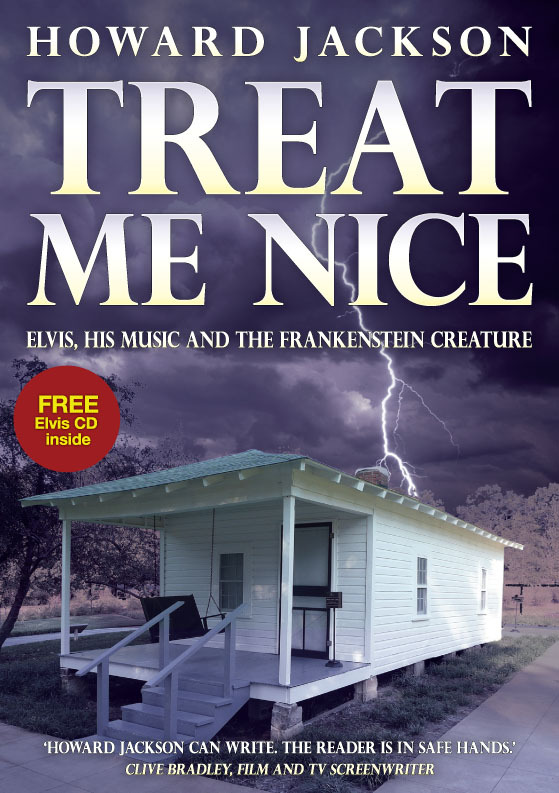 If the early success and good fortune of Elvis distinguished him from the Creature, the story of Elvis has a similar, gloomy ending caused by neglect or a failure to nurture. Not only was Elvis cursed, he knew it and, believing that he had forfeited his opportunity for worth and grace, he wasted himself into an early death at forty two. As Mary Shelley wrote in her novel, ‘But now I was finished, the beauty of the dream vanished, and breathless horror and disgust filled my heart.’ In such circumstances, the notion of a curse should more than suffice for an alternative explanation of Elvis Presley, the creature we are obliged to build inside us. If there will be more than one reference to Frankenstein, the exact meaning of Prometheus can be left to the classical scholars to debate. This Elvis book has ambitions far less lofty. Although this enquiry cannot ignore evidence entirely, it is not the work of a journalist. I am grateful for its existence but the narrative of Elvis has been exhausted. There are plenty of examples of how most of the witnesses, like the villagers who point and shout, have now become unreliable with age. The witnesses say what they want to believe or sometimes have half-heard. They too often remember what they want to make sense and not what happened. My ambition, though, remains considerable. The hope is to persuade others to think differently about Elvis, to reveal something about what makes him and his story significant for all of us and for this child by the lake, in particular. I’m looking forward to reading this book. Based on the description and extract if offers the potential to bring some genuinely new insights to the Elvis story. As noted, the narrative story of Elvis has been well told before. What it seems to me is on offer here is a new perspective on the music itself and Elvis’ relationship with his fans. And was there a curse? I don’t know. But for me the parallels with the Creature seem strong. The creation of others for purposes beyond his own control, and ultimately betrayed and destroyed by his own creator – or perhaps by his own precocious talent and his inability to reconcile himself to having that talent used (and abused) by others. There is much here to explore.